If you are interested in learning more about 3D programs (they really are a blast! ), or other graphics programs, then check out the sites below. These are a few I use and enjoy. Possibly one of the funnest programs out there. It's easy to start making your own graphics without the huge learning curve of other 3D programs. Poser comes with a large and varied set of models (people, animals, clothing . . . ). It also has support in the form of models and figures that can be freely downloaded or bought. 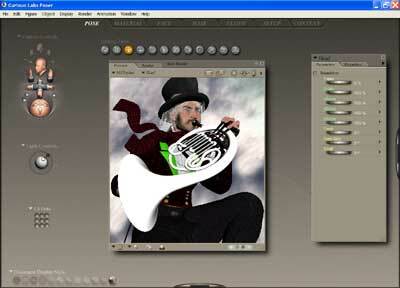 Although Poser is an easy program to learn, what's most impressive about it is that you can learn something new about it every time you turn it on. Poser also can do frame by frame animation. Diard Software Universe image creator - make stars, galaxies, nebula . . . limited freeware version available. One version a stand alone, another version works inside Photoshop. Both are very cool. Apophysis - free fractal generator. Very cool program, created these fractals and these fractals after playing with the program for a couple hours. Final images composited in Photoshop. Ultra Fractal - Another very good fractal generator. Serif Software - a very simple and free 3D program. Does some nice 3D text effects and has a few objects installed. Also has lighting and texturing options. Pretty cool and easy to learn.